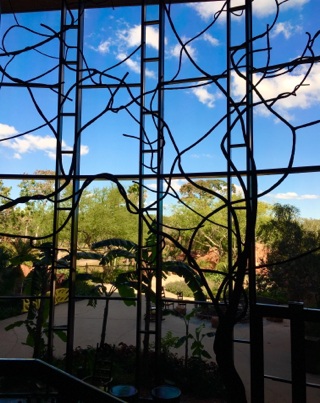 Animal Kingdom Lodge is an amazing resort for many reasons. Its most unique attribute is that it basically sits on a large, African savanna, with dozens of animals. This huge wall of giant windows can be found in the main lobby of the resort. Guests can see the savanna through the windows or walk outside for a closer view. 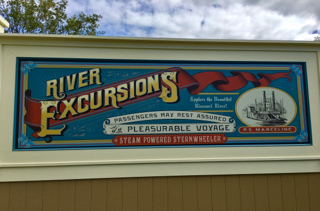 One of the best pieces of historical Disney memorabilia is found in a spot where relatively few guests ever visit. The Villas at Disney's Wilderness Lodge has an area off of the lobby called the Carolwood Pacific room, named after Walt's backyard train. 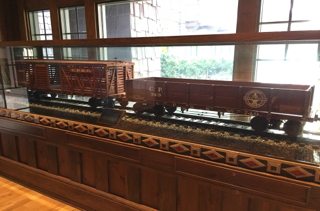 Two of the actual cars from this railroad are on display here. Due to their proximity to a window, it is always tough to get a clear photo. This is a hidden treasure that should not be missed if you find yourself at this resort. 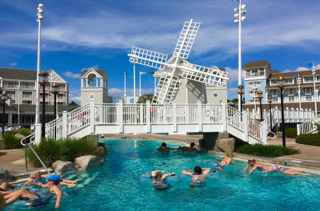 Stormalong Bay is one of the most elaborate pool areas on Disney property. It has a lazy river, a pool volleyball area, and most of it has a sand bottom. I took this shot today, while enjoying Stormalong Bay with good friends. Narcoossee's is one of the best restaurants on Disney property, with excellent food and great views. You won't see it in this photo, because I was standing on the outside deck of the building overlooking Seven Seas Lagoon. 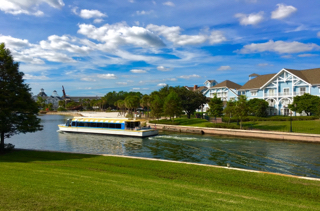 This one view allows you to see Space Mountain, Bay Lake Tower, and The Contemporary, as well as several watercraft. The Boardwalk Resort is one of my favorites to set up a remote office, and work from my iPad for a few hours. There are many great places to sit, and good spots to grab coffee or a bite to eat. 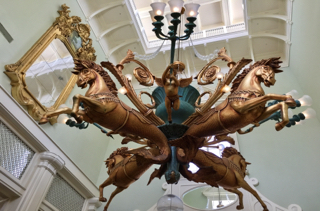 As I walked into the lobby today, I took a closer look at this giant chandelier. I've walked under it numerous times, but never realized how impressive it was. The horses are nearly actual size and each one has a mermaid style backend. It is always fun to visit The Seas with Nemo and Friends at Epcot. This aquarium has 5.7 million gallons of water, which makes it the second largest in the country. 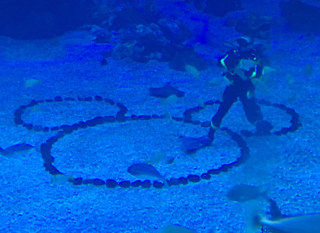 I have taken many shots of this large "hidden Mickey, but this one taken a few days ago may be the first with a diver standing on Mickey's head. Last night, we had dinner at Coronado Springs. As we were getting ready to leave, we heard fireworks going off nearby. When we got outside, I realized they were from the nearby Star Wars show at Hollywood Studios. Although we couldn't hear the music accompaniment, we had a great view of the fireworks. 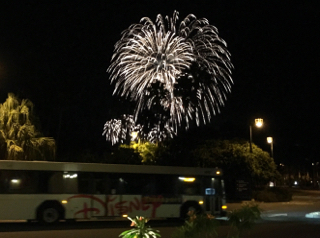 I took this unique shot with the resort bus driving by. 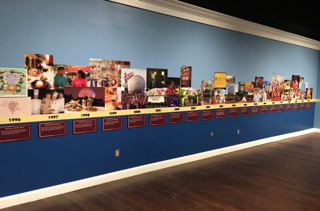 The old Wonders of Life pavilion at Epcot closed more than a decade ago. However, this impressive dome-shaped structure continues to be used for festivals and other special events. 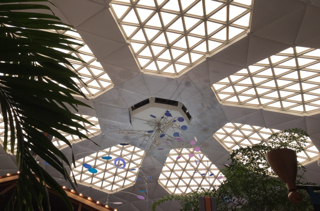 I visited yesterday, during the Food and Wine Festival, and took this shot of the inside of the dome. One of the best themed areas in any Disney park is around Expedition Everest in Animal Kingdom. Many of the items displayed in the queue were actually obtained at roadside stands in the Himalayas. 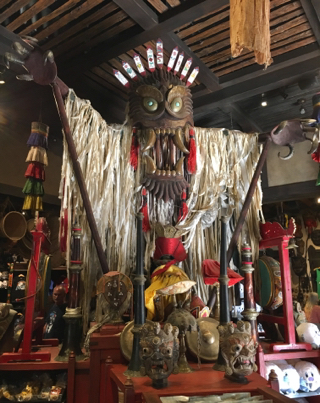 Even the gift shop is filled with elaborate details, including this Yeti "display" in the center of the store. 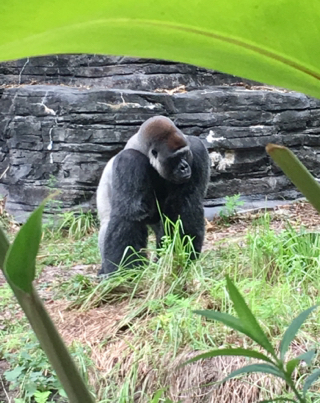 Although Balou is a beloved Disney character who has been around for a long time, he has become an even bigger star with the popularity of the recent "live action" Jungle Book movie. 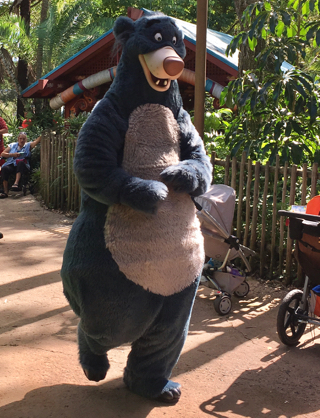 Of course, he can be found greeting guests at Animal Kingdom. I took this shot yesterday, shortly after he emerged from a backstage area. 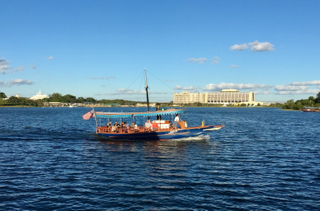 Yesterday afternoon, I left the Magic Kingdom on a "motor launch" on my way back to the Grand Floridian Resort. I had a seat near the captain, and a great view of the lake. 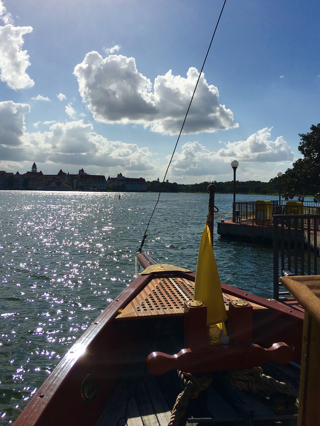 You can see the gold flag on the bow of the boat, which indicates the route that connects the Magic Kingdom to the Floridian and the Polynesian. 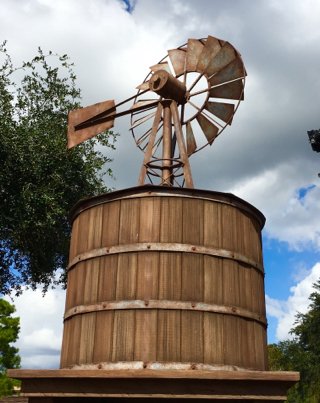 As I was walking through Frontierland today, I took a closer look at this silo and weathervane. As I approached, I realized that it was basically a camouflage for several speakers. There was instrumental country western music coming from the silo. This is an example of Disney hiding modern technology in appropriately themed structures around the park. When my tour guests are and joying and attraction, I typically wait for them near the exit. One of my favorite spots is at the exit of Kilimanjaro Safaris. This is a place where you can see male gorillas roaming the terrain. I took this shot a few days ago, and framed it with some large leaves from a nearby plant. Although the major "Star Wars Land" expansion at Hollywood Studios is still years from completion, this park already has many great Star Wars offerings. We enjoyed the "A Galaxy Far, Far Away" show on the main stage this afternoon. 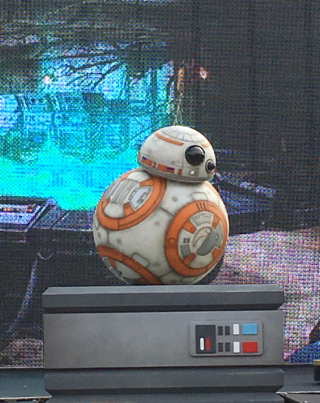 I was able to snap this shot of BB-8 toward the end of the show. There are four large "quick service" restaurants in the Magic Kingdom. 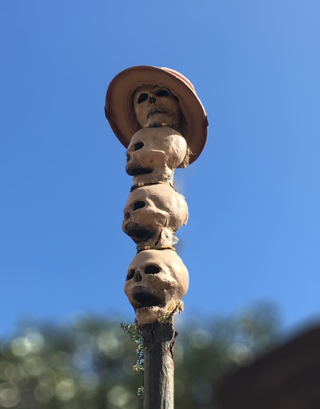 Each one has unique and detailed theming. 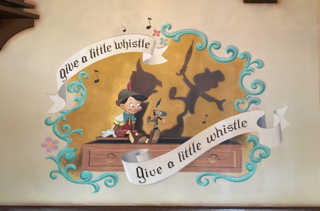 The Pinocchio Village Haus is in the center of Fantasyland, and features painted scenes from that movie on its walls. I took this shot while giving a tour yesterday. 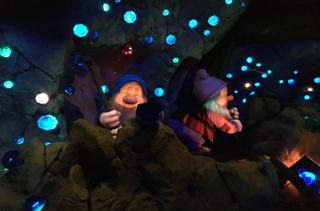 There are many dark rides at Walt Disney World that I've never been able to get clear pictures in, because of the low light levels and the motion. However, when the attraction temporarily stops while I'm riding, the camera comes out quickly, and I start shooting! 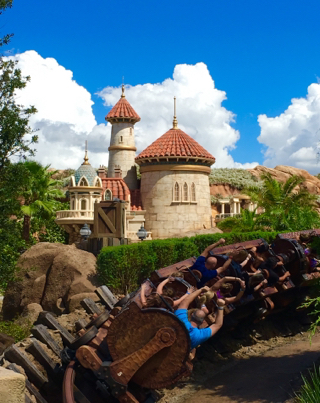 This happened yesterday while riding Seven Dwarfs Mine Train. 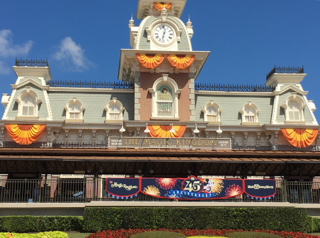 One of the Best things about Halloween season at Magic Kingdom is the amazing decorations found on Main Street, USA and the hub. 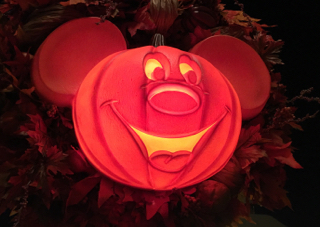 There are hundreds of jack-o'-lanterns and Mickey pumpkins throughout the area. I took this shot the other night, prior to watching the Main Street Electrical Parade. 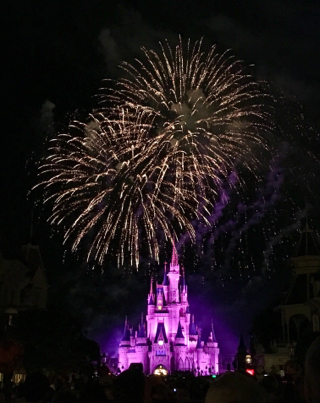 Although I've taken hundreds of pictures of the Magic Kingdom fireworks, it has been a while since I have seen Wishes. A few days ago, we went to see The Main Street Electrical Parade in one of its final performances. Of course, we stayed for the fireworks afterwards. We had a great view, right in the middle of Main Street. 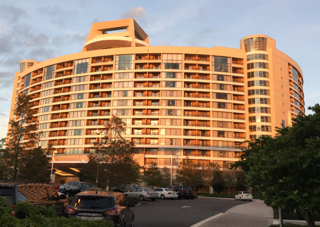 Bay Lake Tower is one of the newer Disney Vacation Club resorts, and it sits adjacent to The Contemporary. I took this shot while walking to the Magic Kingdom last night. I always like the lighting for photos at Bay Lake Tower around sunset. 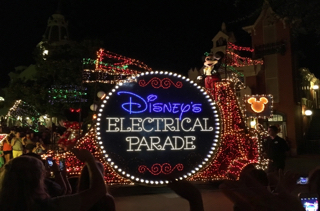 The Main Street Electrical Parade has had several stints at the Magic Kingdom. However, it will be leaving for the final time after tomorrow night. We had the chance to enjoy it one last time tonight. This spot in New Fantasyland allows you to get a picture of the two prominent attractions in that area. You can see the Seven Dwarfs Mine Train coasting by, as well as Prince Eric's Castle, from Journey of The Little Mermaid, in the background. I took this shot while giving a Magic Kingdom tour yesterday. Today, I found myself in the exit area of Walt Disney's Enchanted Tiki Room, waiting for my tour guests. 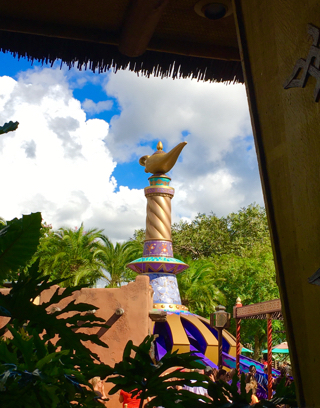 I liked the way that The Magic Carpets of Aladdin was framed by the nearby foliage and building. The blueness of the sky is also a highlight of this photo. 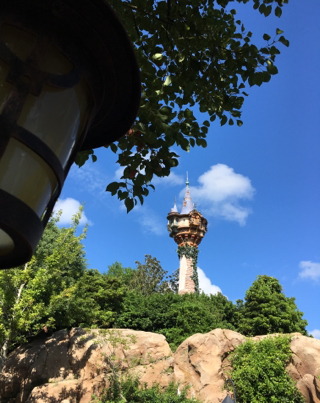 Yesterday, I caught a unique view in Liberty Square that is rarely seen by guests. 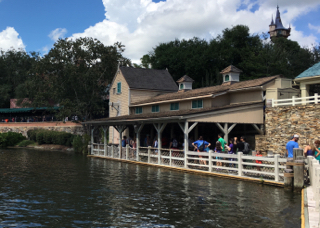 It was a busy day at Magic Kingdom, and the line was long for Haunted Mansion. Since they are still doing work on refurbishing part of the queue, they used this secondary area to prevent the line from extending too far into the main walkway of Liberty Square. It actually went down a ramp toward the Rivers of America, and through an old structure that is normally off limits to guests. In the old days, it was the Mike Fink Keelboats loading dock. That attraction has been gone for many years, but it is nice to see the building get some use. The Streets of America had been part of Hollywood Studios since the park opened in 1989. 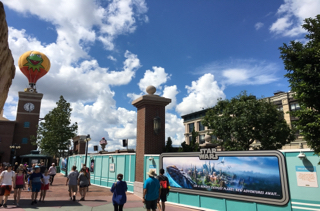 However, this area is in the process of being demolished to make way for the new Star Wars "land." You can see from this shot that half of the street is now gone and the view has changed drasticallly as you approach MuppetVision*3D. I took this photo while giving a tour on Wednesday.